The United States government shutdown is making life difficult for users and businesses seeking to remain compliant with laws and regulation, with websites carrying the necessary information and reporting tools closed down. Several important sites such as those of the Federal Trade Commission (FTC) and Federal Communications Commission (FCC) displayed shutdown notices instead of the usual information on rules and regulation, and resources for citizens, businesses and other organisations. Other government sites are also not updating information during the shutdown. 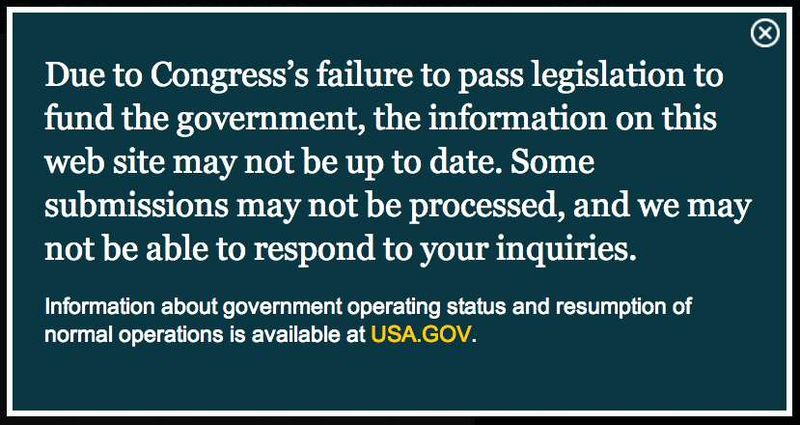 As a result, people are unable to consult legislative documents published on government sites. Speaking to US congressional paper The Hill, Joe Hall at the Centre for Democracy and Technology Lobby group pointed to the new Children's Online Privacy Act (COPPA) law that came into effect in July this year and which regulates how websites interact with users younger than thirteen - compliance documents for COPPA are stored on FTC's website, but anyone looking for them gets only a shutdown message. Another organisation, the Association of Competitive Technology (ACT), told The Hill it had uploaded the FTC COPPA documents to its site so developers could use the resources and continue to build apps. ACT executive director Morgan Reed expressed surprise that the entire FTC website had been taken down including static content, but said it made sense since the agency still had to pay for bandwidth during the shutdown. The shutdown of the US government is in its second week and a result of legislative impasse in the Congress lower house. Conservative Republicans continue to demand changes in Democrat president Barack Obama's Affordable Care Act that extends healthcare to low-income earners, in return for raising the ceiling on the amount of debt the government can amass to continue to operate. Some sites, such as the United States department of agriculture's food safety and inspection service (FSIS), remained up and yesterday warned Americans about a large-scale outbreak in eighteen states of salmonella in raw chicken products. However, due to the shutdown, food safety inspectors were not permitted to work to trace the salmonella outbreak to specific products and when they were produced. A skeleton service that includes the National Vulnerability Database and atomic clock time service is being operated by the US National Institute of Standards and Technology (NIST), but the main site itself and resources are not available during the government shutdown. NIST is tasked with developing cyber security policies for government agencies and provides several critical information technology infrastructure features such as accurate time keeping. The Securities and Exchange Commission (SEC) that regulates financial markets and institutions remains up and running. However, it may shut down [PDF] at a later stage, if the government funding row continues. Intelligence agencies such as the CIA are not affected by the shutdown, but at the time of writing, the National Security Agency (NSA) website was down.